Cities Connection Project | CITÉ UNIVERSITAIRE EXPANSION. GENEVA. In accordance with the master plan, the new building defines a central courtyard for the campus. Underground, leisure and sport facilities (multi-purpose hall, music room, playroom, projection room, sauna and squash courts) are built around three sunken patios. This space is directly connected to all the existing buildings making it a place of gathering, encouraging social exchange in the campus. The typology of the new building is quite specific to student housing encouraging community spirit without sacrificing privacy. The 75 studios and apartments housing 300 students are organised around a central atrium containing the vertical distribution and covered by a mobile glass roof. This space aims to be the catalyst of a richer social life by providing more transparency, more visual contact and places to meet others. Moreover it’s role as a regulator of the interior climate is beneficial and will reduce energy consumption. The student room is the structural unit of the building. This cell also determines the visual identity of the facades. Through the glazed interior facades the kitchen/living room and the corridors participate strongly in the communal life. The former is recognised by bow windows and both are furnished with colourful curtains. Each apartment has a balcony on the other side. There is also a kindergarten for 60 kids on the ground floor with a separate entrance from the courtyard. 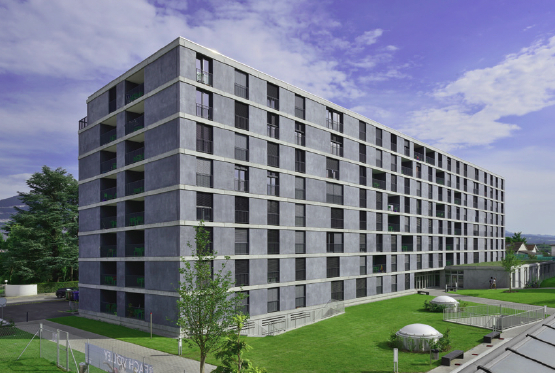 A modular structure together with prefabricated concrete elements (base floor slabs, facades, bathrooms) allows an affordable rational construction.